Ok, it takes a bit more than carrying an inflated kangaroo on your head and running next to the racers to win "best fan costume" in my book. From the Lance years, I always dug the bighorn helmet guy, the occasional spider-man/batman, and that one time when a fake rider got in the action, and do I ever wish the Specialized Angel would show up! Also, while always looking for the snarky graffiti on the road, I haven't seen the usual phallic symbols or any El Dope's. 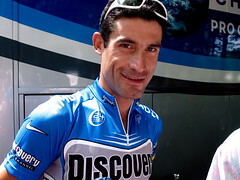 And there's the Devil, who was interviewed by Bicycling Magazine. Zabriskie, Honchar, Tour Devil Didi Senft, by Caroline Yang. Graham Watson actually came up behind Landis and caught him during the bike change here; here's Watson's full TT gallery. BikeZen's Mark Shimahara's TT gallery. BBC Sport Stage 7 photo gallery. The Red Devil of the Tour de France is branching out. Didi Senft, who appears annually dressed as a devil at many of the Tour's toughest stages, wants to be a part of the publicity surrounding the upcoming soccer/football World Cup, kicking off in June in Germany. He's built a giant, rideable tricycle using regulation soccer balls as tires. It looks to be a modification of his world record bicycle, since it shares some dimensions: 7.8 meters long, 3.7 meters high. That's about 26 feet long. Check out the video above to see Didi take it out for a little ride. That third picture is Didi Senft on one of his giant bicycles. "Lance, come back here - You owe me your soul!" ESPN.com | The Devil, you say? 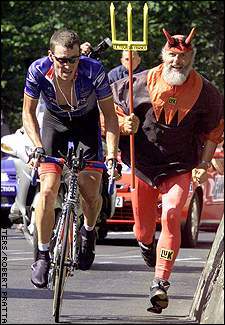 ESPN's Page 2 ran a funny captions contest featuring Lance Armstrong and the Tour's red devil, Germany's Didi Senft. My favorite is the title of this post. What mall Santas do in the offseason. "No, I don't care who you say you are, you can't ride on my handlebars! The Devil goes down to Belgium? PezCycling News | The DEVIL: PEZ-Clusive Interview! PezCycling catches up with Didi Senft, the German who shows up at races and gets more publicity than some of the riders. Last year, in honor of the Centenary Tour, he went a little overboard and set up a number of scenes along the course. He's been chasing the riders in that costume since 1993. Strangely, he keeps the same costume, but changes pitchforks depending on the event. Senft is also a bicycle-mad inventor, and holds the record for the world's largest rideable bicycle. Didi was featured (on tape) on Craig Kilborn's Late Late Show on CBS last night, as part of his "This Just In" segment. Just in time for the Tour, there are a number of new titles available in bookstores. Lance Armstrong: Images of a Champion is a collaboration between bike racing's best photographer, Graham Watson, and Lance Armstrong. It features hundreds of shots of Armstrong, from the familiar — Watson's 3-frame montage of Armstrong's fall during last year's Stage 15, Armstrong crossing the line in Oslo as the youngest-ever road world champion — to behind-the-scenes shots of the day Armstrong thinks he lost Liège-Bastogne-Liège by pre-riding 100 kilometers of the course in a pouring rain, Armstrong taking a comfort break with the help of teammates, and (page 65) Armstrong accepting a wet towel and drink from one Emma O'Reilly at the end of the Metz time trial on the 1999 Tour. Almost every important race of Armstrong's career is here, including all the Tours, the classics Armstrong has ridden, and some of his American races. If there's any criticism to be made regarding the photos, it's that there are very few photos of Armstrong during and after his cancer treatment, since Watson continued to cover cycling during Armstrong's illness. It feels a little strange, since the recovery is such a big part of the Armstrong story. Every chapter starts with Armstrong's analysis of where he stood at going into the season, and the pictures include a comment or two from Le Boss. Sprinkled throughout are tributes from Lance's mother, his coaches, and from fellow 5-timers Miguel Indurain and Eddy Merckx. There's also a complete rundown of Armstrong's results through the end of last season. From OLN-TV's lead cycling anchor, Bob Roll, comes The Tour de France Companion, part primer and part handbook, from someone who has ridden the Tour and still follows the sport closely. If you've read Bobke's VeloNews columns or his other books, this one will seem a little, well, sedate. In order to appeal to as broad an audience as possible, I'd say this one is written at about 5.5 Bobkes, with only occasional dips into the colorful language common in his other, um, writing. It's a very nice book. If you're just getting into the Tour, it's all laid out here: What the jerseys stand for, how many teams participate, and the specifics of the 2004 course. If you've followed the Tour for a few years, you'll still learn something: Haribo distributes 2,000,000 packages of GummiBears at the Tour each year, what it means to be the Lanterne Rouge, what's the deal with Didi Senft? There's a brief chapter devoted to the Tour's history, and a timeline and list of Tour records at the end. It's a little strange to see a book about the Tour that spends so little time discussing the sport's doping scandals and allegations, but it's a treat to see a book aimed squarely at the US market talking about the world's greatest sporting event. Finally, there's a softcover edition of a book I reviewed in December, The Official Tour De France: Centennial 1903-2003, a terrific overview of the Tour's storied history, with a page or two on every year's Tour, and contemporary stories from L'Auto and L'Equipe.